10-5-05 – I’m dashing out the door in a minute, heading to Oregon where I will be speaking at the Portland Fall Home & Garden Show, October 6 – 9. Still I’ve managed, I’ll have you know, to complete and publish FULL updates this time around … Top Pick, Plant Spotlight, Don’t DO That, and Myth of the Week (that features a VERY important reader response to a past, er, myth). In July I received an e-mail from a reader who had several crystal clear opinions about a majority of the contents of this website. She wondered why I didn’t write about gardening in the fashion of most garden writers, filling magazines, newspapers, and cyberspace with positive, cheerfully written, useful gardening tips. Don’t buy red geraniums. Buying red geraniums nearly always necessitates planting them in your garden, or using them in containers that run the risk of being seen from the street. Red geraniums are a no-no, as any snob who gardens will never tell you. There is a small, family-owned specialty nursery in rural Wisconsin with a handmade sign at the entrance drive that reads, We DO NOT sell red geraniums! You either get that story or you don’t. In garden design, the color red can be a nuisance, and any plant that flings great globs of it in your face is considered trash, but beginning gardeners are drawn to red geraniums like moths to a flame. “Ah, now there’s color.” The big suburban nurseries know this, which is why every spring one sees those ghastly green spike plant things plunked into the center of plastic, ready-made patio pots, surrounded by red geraniums. Psssst … red geraniums are for trailer parks. Don’t stay home on days the landscapers are coming. Landscapers HATE IT when the client is home during the day. We hate it when you come out every few minutes or every hour, to chat, to ask questions, to check on our progress. All work slows down. Our train of thought—a landscaping project is impossible to accurately design on paper, it inevitably becomes one big, long train of thought—is completely derailed. Conversation among crew ceases, tools are awkwardly snatched, cigarettes snuffed out. If you work from home, stay inside on days the landscapers are coming. If you don’t work, spend the day at the club. If you work in an office, don’t take a vacation day; go to work! Better yet, be the kind of client I prefer to work with, the kind that packs up in April and goes to live in Europe. Here’s a nifty trick the kids will enjoy: Buy a sheet of copper at the hardware store, or send the help, then cut it into half-inch wide strips. Place the strips flat on the ground around plants on which you’ve noticed slug damage. At night, the slugs will leave their grotesque hiding places, and cross the copper strips. A sophisticated and marvelous chemical reaction takes place, wherein the slime on their underbellies reacts with the copper, and they electrocute themselves on the spot. Unfortunately, there’s no sound to the process, no crackling, popping noise, or the kids would make it their life work. Never rent a Bobcat. Now that all Americans have become do-it-yourselfers, more and more rental shops stock Bobcats. It used to be one had to drive forty miles to a contractor’s rental outlet to rent a stupid Sawzall; now, the hardware store on the corner will rent you an A220 Bobcat steer loader that could knock your house down. It probably will. Learning how to safely and efficiently operate a Bobcat, or any kind of track or skid-steer loader, takes about twenty hours. So for most homeowners facing the typical do-it-yourself landscaping project, renting one will be the quickest burning of $345.00 they’ll ever witness. That’s the average daily rental, though they’ll start by opting for the $140.00 four-hour rental, figuring that stacking up those boulders into a retaining wall should be a fun chore finished before lunch. It will take you four hours to get the thing off the trailer without tipping it on its side. After one day you can maybe raise the bucket up smoothly without dumping pea gravel on your head. Bobcats are sophisticated, tricky, and dangerous. Operating one for the first time is similar to sitting down at a drum kit where a missed beat can kill you. Never rent a Bobcat; rent a guy who owns one. Just say NO to little balls. Little balls, little balls, little balls—homeowners (and lazy landscapers!) seem to love surrounding their homes with tight tutus of plants sheared into little balls. There appears no shortage of local landscapers who will gladly promulgate this gruesome stab at landscape design. Five spirea in sun in front, whacked into little balls; potentilla, the most worthless plant in the trade (common name: gas station plant) whacked into little balls along the side, all complimented by the granddaddy ball of them all, the Techny Globe arborvitae, planted in a row anywhere there is shade. The whole scene set off by a carpet of decorative rock, of course, though not even shredded hardwood mulch could save it. “Church landscaping,” I call it, and my apologies if your church, synagogue or mosque has really terrific, creative landscaping. 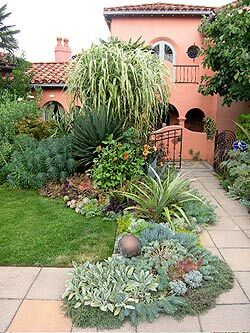 Landscaping a home should be an attempt to wrap it in nature, and that means planting trees and shrubs that are going to stretch and reach and provide jagged vertical, horizontal, and diagonal form. There are no little balls in nature.